Many thanks for providing such an interesting and informative Procol Harum website. Although I am a music fan rather than an out-and-out Procoholic I often check “What’s new” and regularly browse amongst the wealth of information elsewhere. There is one small thing that I can contribute though, and that is to clear up the uncertainty regarding the gig at Leeds University in October 1974. I was a student in Leeds at the time, and I went along to the gig and still have a cassette recording that I made on the night. So I can confirm that it did indeed take place and that the set list was as shown above. I’d not seen Procol Harum before and was seriously impressed by just how powerful and accomplished the band was as a live act. For me, Exotic Birds and Fruit was their best album since A Salty Dog, so I enjoyed the featured tracks (with references to contemporary politicians thrown in). The absolute highlights though were Homburg (a favourite of mine that I didn‘t expect to hear live) and a sledgehammer version of The Devil Came From Kansas. During Kansas, Mick Grabham would bend his knees and slowly sink down just before the guitar breaks (perhaps to adjust a pedal ?) and then he’d rise up, swaying, as he unleashed the solos. As you watched, you could see him gradually preparing, and you knew the guitar break was imminent, but BJ would be twisting time by extending the drum fills, and between them they’d manage to create this sense of tension as to whether Mick would actually hit the mark. They were spot on of course, and BJ’s drumming was colossal (in a good sense!) throughout the set. Power Failure was another highlight which Gary introduced by saying that BJ “likes a theme to work to”, that it was 25 years since the founding of the Republic of China and that “… he’s got a red drum kit!”. The Poet (which Gary said they hoped to have available “in stores and jukeboxes soon”) was also excellent (rocking but tuneful) and seemed to have real hit potential. A shame it was never released in that form. The fact that the gig was billed as a Freshers' Hop meant little apart from the fact that it was the first big gig of the academic year, although Gary does mention the fact that there are lots of “fresh people” there … to some ribald amusement. I have no recollection at all of the advertised support band Tuesday, but I do remember seeing Strife at Leeds University (they were memorable for all the wrong reasons) and my guess is that, as happened elsewhere on the tour, Strife was actually the support band that evening. As regards the poster, my impression was that the university gig posters of that era were designed and printed in-house (by art students). They were produced in fairly small numbers to publicise the gigs around the university and in town, and surplus copies would be sold at the gig and perhaps in the University Union shop over the next few days. They certainly wouldn’t be have been available for long or in large numbers, and the copy sold on eBay must therefore be quite a rare survival. 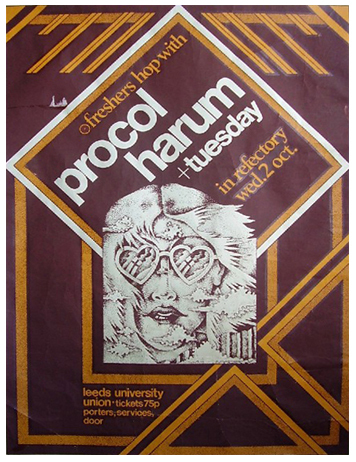 Incidentally, the fact that this was my first (actually my only) Procol Harum gig wasn’t through want of trying on my part. During the Home era my girlfriend and I went to a gig at the Fishmonger’s Arms in Wood Green to find that it had been cancelled at short notice due to illness. A year or two later I went along to Fitzwilliam College in Cambridge where the gig (mentioned in your item about Chris Copping) was scuppered by transport problems. I remember Chris and Dave Ball jamming with Supertramp although, to be honest, my feeling by then was that Supertramp had (to use Jane Austen’s phrase) “delighted us long enough”! I definitely got the impression that Chris and Dave felt that the band should have played despite the late arrival. I remember leaving names and addresses as we left and some weeks later I received a cheque for about 60p, representing the partial refund on two tickets due to Procol Harum’s non-appearance!